High Strangeness: Good Luck, Earthlings! Follow the rules for a chance to win 1 of 3 prizes! - 1st place will receive a 60 in. inflatable alien with novelty alien hat, t-shirt, cap and sticker. - 2nd place will take home a 54 in. inflatable alien with novelty alien lanyard, t-shirt, cap and sticker. - 3rd place will receive a 36 in. inflatable alien with t-shirt and sticker! 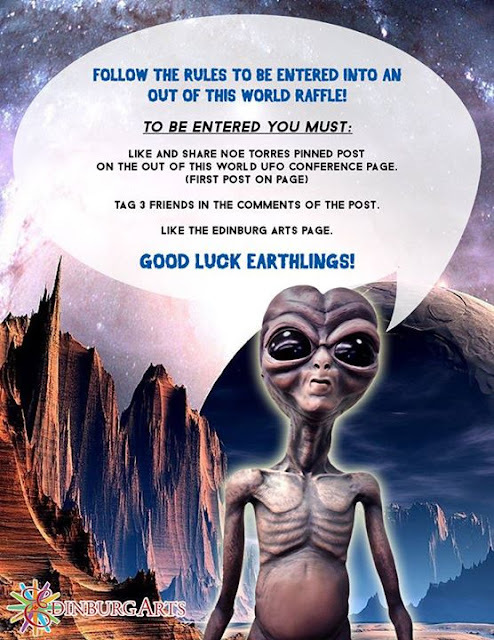 Winners will be announced and tagged on the Out of this World UFO Conference page one week before the event. So, the aliens are good at marketing, too... We're goners. What is this poster telling us? Is the Edinburg "Out of This World" UFO Conference & Festival actually being run by aliens? Is "Good Luck, Earthlings!" an encouraging message along the lines of "May the Best Human Win"? Or is it a malevolent threat, along the lines of "Good luck fighting back against our particle ray beams with your puny A-bombs, humans"? Either way, it kind of strikes a blow for honesty, doesn't it? Of course, there is another possibility... Is this "contest" actually a screening process to identify humans who have above-average abilities, so the aliens can recruit them to their cause, a la "The Last Starfighter" and "This Island Earth"? Will contestants be asked to assemble an Interociter? If so, I want to be there, because I've always wanted an Interociter, and I'm pretty sure I could assemble one. 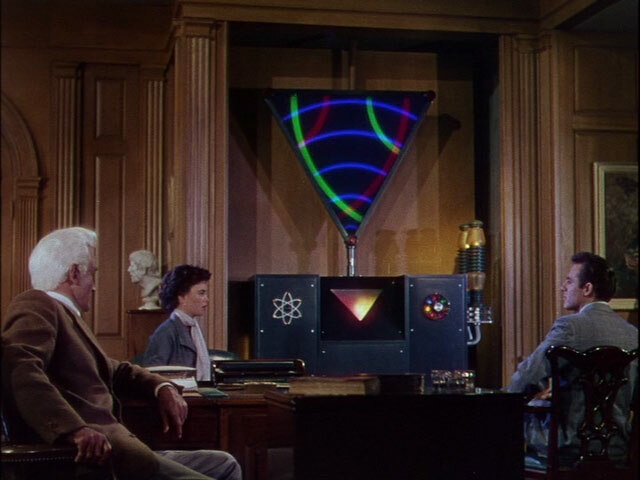 Behold the Interociter: Alien communications device that also makes a handsome addition to your study or den. How do I book my flight to Edinburg, TX?